In June 1972, a woman appeared in Cedar Senai hospital in nothing but a white, blood-covered gown. Our story begins very simplistically. This is good, I like simple. However, the wording is a bit… weird, especially when we reach the ending. We'll discuss this later. Other times, they have other people bring them because they're weak and can't walk off a simple broken limb, gunshot, or severed limb. Plebs. but there were two things that caused people who saw her to vomit and flee in terror. Horror writing 101: don't ever say that there were X things that were especially super duper spooky. Simply go ahead and tell us or show us from our characters perspective. Doing the former is wasteful. There are situations where it can work, but as generic narration: it's a bad idea. The first being that she wasn't exactly human. She resembled something close to a mannequin, but had the dexterity and fluidity of a normal human being. Her face was as flawless as a mannequins, devoid of eyebrows and smeared in make-up. I honestly love this description. It's simple, brisk, to the point, and effectively off-putting. I just wish there wasn't that “the first being” part. It sticks out like a sore thumb and feels somewhat jarring to an otherwise well structured sentence. There was a kitten clamped in her jaws so unnaturally tight that no teeth could be seen, and the blood was still squirting out over her gown and onto the floor. She then pulled it out of her mouth, tossed it aside and collapsed. I generally dislike gore for the sake of gore. This story uses it well though. Very well in fact. It's very weird, unsettling, and works to showcase the oddity to this individual. However, I'll never find animation cruelty to something I can stomach well. Oh well, that's just me. From the moment she stepped through the entrance to when she was taken to a hospital room and cleaned up before being prepped for sedation, she was completely calm, expressionless and motionless. Here I thought she was cracking jokes and laughing like she was in an Adam Sandler film. Could've fooled me! The doctors thought it best to restrain her until the authorities could arrive and she did not protest. It turns out she'd stepped into a veterinarian hospital that specialized in cats. They were unable to get any kind of response from her and most staff members felt too uncomfortable to look directly at her for more than a few seconds. She had a very distracting mole and a scar in the shape of H.R. Geiger. But the second the staff tried to sedate her, she fought back with extreme force. Given that she's described as being unnervingly calm and, well, expressionless, do they need to sedate her? I'm guessing it's probably standard procedure, but I find that really… weird. Two members of staff had to hold her down as her body rose up on the bed with that same, blank expression. She turned her emotionless eyes towards the male doctor and did something unusual. She smiled. As she did, the female doctor screamed and let go out of shock. In the woman's mouth were not human teeth, but long, sharp spikes. It's a creepypasta. What were they going to be filled with? Danny Bonaduce posters? That ellipses was definitely needed. The male doctor stared back at her for a moment before asking "What in the hell are you?" “I'm Batman,” the woman replied. Then Christopher Nolan swooped in with Christian Bale and announced a fourth Dark Knight film. She cracked her neck down to her shoulder to observe him, still smiling. I like this sentence, but “cracked her neck down”? Maybe I've seen too many horror movies, but that part is cringe-worthy. I think “tilted her neck down” would've worked better. It's simpler and more casual. It also fits better considering this character has been shown to have acted normal up until now. Why change that now? Accommodating for the reveal feels kind of… silly. There was a long pause, the security had been alerted and could be heard coming down the hallway. They ran past the room. Turns out, Old Man Harris thought he was Sylvester Stallone again. As he heard them approach, she darted forward, sinking her teeth into the front of his throat, ripping out his jugular and letting him fall to the floor, gasping for air as he choked on his own blood. Ugh… okay, lemme just say that this was to be expected since she was shown to have razor sharp teeth. Anyone who didn't expect this is either naïve or hasn't read enough creepypastas. But this begs a serious question that only now hits me as I write this: did nobody know she had super sharp teeth when she was biting that cat? Did nobody see the bite marks? Second of all: while I'm not fan of gore for the sake of gore (as stated earlier), I still don't inherently hate this part. Mostly because it's quick and to the point. Yet, I can't help but find it so… pointless and shallow. Maybe it's thanks to how short this story it or because of how simplistic it is. Either way, it has no weight to it. Sill, it isn't the worst part of the story. She stood up and leaned over him, her face coming dangerously close to his as the life faded from his eyes. Considering she just ripped his jugular out, I think “dangerously close” isn't necessary. Also, while I'm at it: this would've been a better and more impactful time for her to have bitten him. It would've had more build up as opposed to just happening. She leaned closer and whispered in his ear. Uuuugh. I despise lines like this. It was the worst part to Abandoned by Disney—another story I genuinely really liked—and one of the most cringe-worthy moments in Sonic.exe, and that's saying a lot for that story. All of that said: I cannot say enough how stupid it is for a character up and say, “Hey everyone: I'm God!” It isn't bad per-se, but nine times out of ten, it feels forced and unneeded. In my personal opinion, it's best used by those who don't have superhuman capabilities. Rather, they have delusions of grandeur; they're cult leaders. That isn't me saying they religion is a cult mind you, I'm personally Catholic, but there's no weight to this thing saying it's “God”. Not when the standards of creepypastas have the likes of Jeff the Killer, who might as well be on the same level as Thanos with how people portray him. My point is: if you want to write a creepypasta: don't have your monster nor bad guy refer to itself as “God”. Not unless it's an actual god. The doctor's eyes filled with fear as he watched her calmly walk away to greet the security men. I'll admit: this line, corny as it may be, was amusing. Though I think it's poorly executed considering the general lack of levity shown in this story. His last ever sight would be watching her feast on them one by one. I'm somewhat disappointed that there's not more showcased here. It'd be interesting to see how agile this thing is, especially if any of them tried to shoot it. 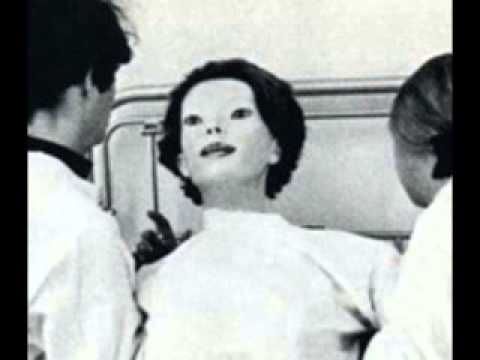 The female doctor who survived the incident named her "The Expressionless". I would've called her “Ms. Sharpy”. There was never a sighting of her again. This is what I meant when I start the wording in the opening sentence/paragraph was weird. So, she was never seen again, yet she was wearing “nothing” but the white gown. How exactly did anyone know this? Did a doctor inspect her to see if she was wearing undergarments? If so, that's creepy, but for a very different reason. Unless that's standard medical procedure. And that's “The Expressionless”. It's far from the best story ever written. But, in spite of its shortcomings, I still greatly enjoyed it. Heck, I think it holds up better than when I last read it. Sure, its ending is a bit rushed and there are a plethora of things I'd have done differently, but it does what it sets out to do: weird person enters hospital, shows it isn't human, rampage, the end. Its intention is simple and it succeeds. That, to me, is all that matters. Let me know if you liked it though! Possibly the most boring horror story I've ever read. Sure, you think it's worth something, but it honestly didn't scare me, get my heart pumping or anything like that. I am god is definitely a cliche that needs to go away. Along with you and I aren't so different. Other then that its not the worst story ever.